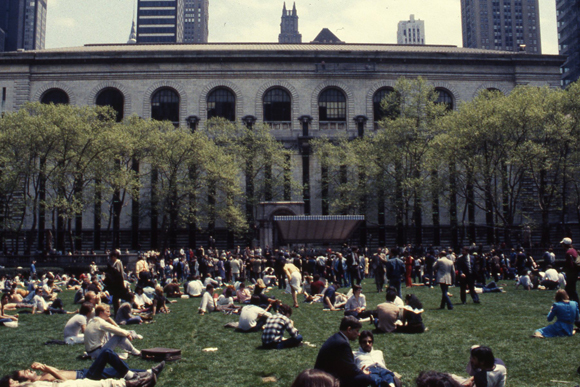 Bryant Park Blog: From the Archives: New York Public Library Turns 100! 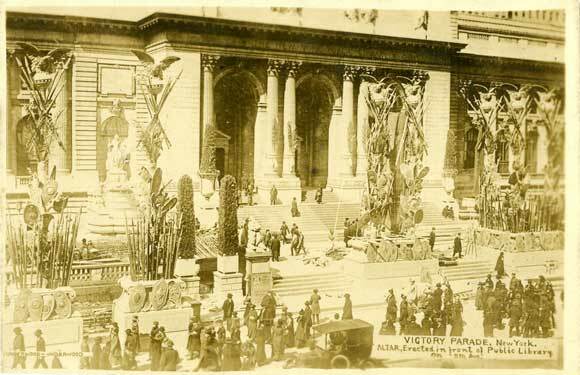 From the Archives: New York Public Library Turns 100! In this post, BPC's archivist, Anne Kumer, shares some history. It also appears on NYC Circa, a history blog about New York City and its public spaces. 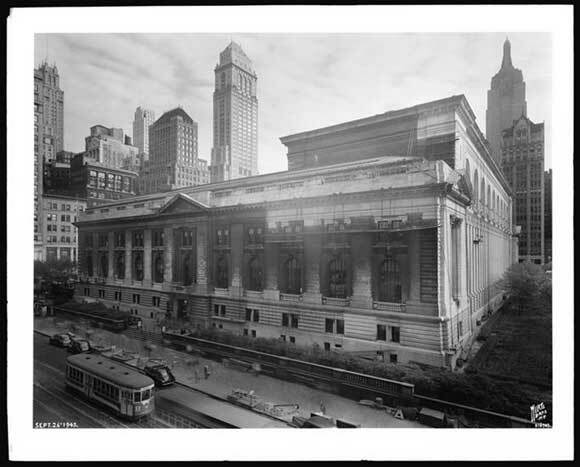 To commemorate the 100th birthday of the New York Public Library, and its central branch, the Stephen A. Schwarzman building, lets take a look back at the library through the years. Before the Beaux-Arts building designed by architecture firm Carrère and Hastings was built, the two-block section of Fifth Avenue between 40th and 42nd Streets was home to the Croton Reservoir. The reservoir was torn down in 1899 to make way for the library. To read more about the demolition of the reservoir, and subsequent building of the library, click here. Construction began in 1902, and was no small feat. When completed, the library was the largest marble structure in the country up to that time. 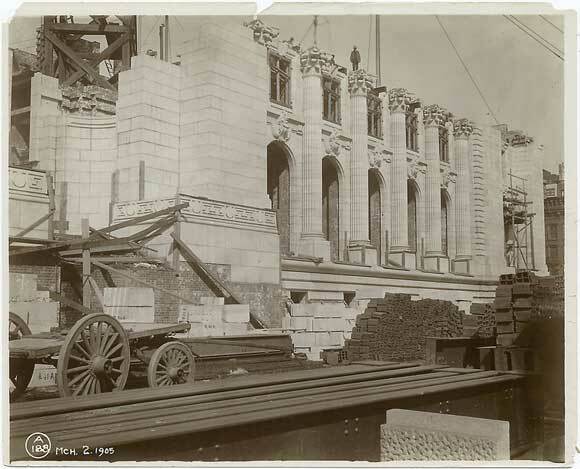 This photo, from the NYPL's digital photo collection on the central building, shows exterior marble underway in 1905. 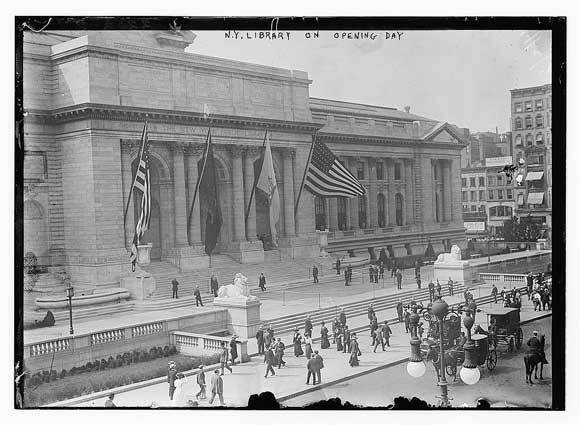 The library opened to the public on May 23, 1911 with an elaborate ceremony presided over by 27th President of the United States William Howard Taft. Those flags are massive. In 1919 the building served as a backdrop for a WWI victory parade along Fifth Avenue. Every stationary part of the building and street appears covered in shields, spears, and eagles. Shields and crossed spears often signify the defense of freedom, and eagles have long been associated with power and the U.S. I'm guessing that's their significance as decorations. If anyone knows otherwise, please email me. 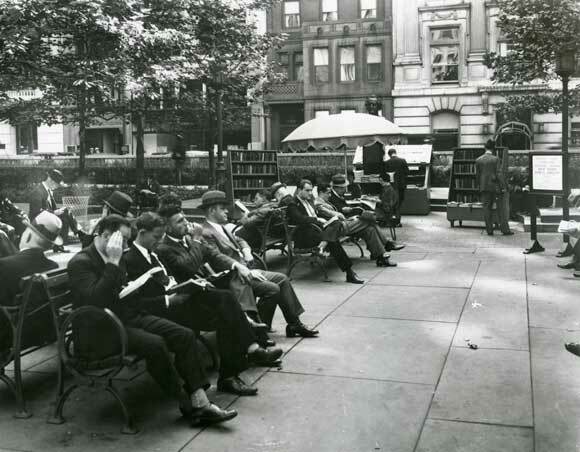 In the mid-1930s the NYPL established an outdoor reading room and called it the Bryant Park Library at Central Building. Much like our current reading room, patrons could enjoy books, magazines and newspapers outside in the park. 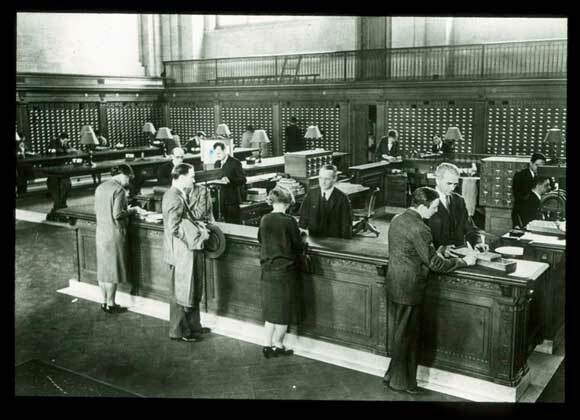 The 1930s reading room was located on the Upper Terrace, just behind the main library building, and staff librarians were on hand to assist patrons. The library gets a scrub in 1945, seen here from 42nd Street looking east toward 40th Street. The World's Tower building on 40th Street looks huge in comparison to surrounding structures; the Empire State building is off to the right, just behind the Engineer's Club building (recently designated a landmark by the Landmarks Preservation Commission). Librarians and archivists: making research easier for 100 years and counting. The Bryant Park lawn (no chairs!) and rear facade of the library, May 1984. 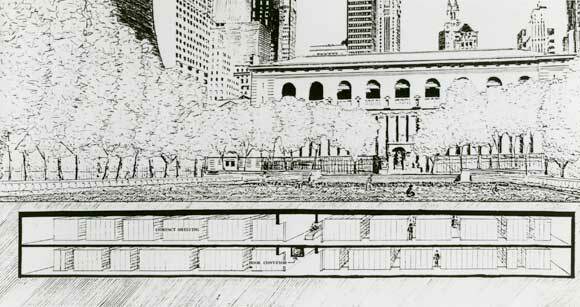 In 1988 the NYPL put two floors of additional library stacks beneath Bryant Park's lawn, seen here in a rendering by Hanna Olin, the design firm responsible for BP's redesign. ﻿Around this time last year, Improv Everywhere paid a visit to the the reading room, and re-enacted (sort of) the opening scene from Ghostbusters. ﻿The NYPL has been hosting a number of events in celebration of the centennial, most over this past weekend. The library also has a special exhibit called "Celebrating 100 Years" on view until December 31, 2011. Here's a NY Times review.